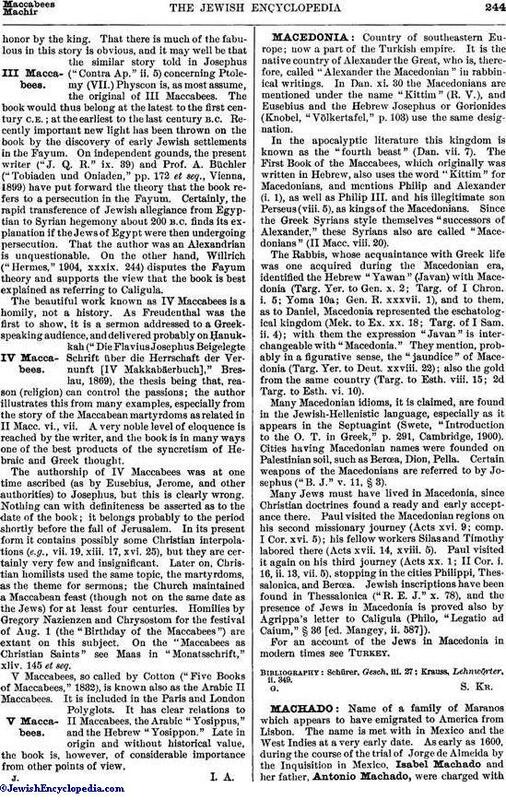 Name of a family of Maranos which appears to have emigrated to America from Lisbon. The name is met with in Mexico and the West Indies at a very early date. As early as 1600, during the course of the trial of Jorge de Almeida by the Inquisition in Mexico, Isabel Machado and her father, Antonio Machado, were charged withbeing Jews. Abraham de Macado is mentioned as a resident of Martinique in 1680, and M. Machado is known to have been a planter in Surinam, about 1690. The most important family bearing the name in America is the one in New York. It is descended from David Mendez Machado, who went from Lisbon, as a refugee from the Inquisition, to England, where he joined the emigrants going to Georgia, arriving at Savannah in 1733. David Mendez Machado married Zipporah, daughter of Dr. Samuel Nuñez, one of the early settlers of Georgia, and shortly afterward left Savannah for New York; there, in 1734, he became ḥazzan of the Spanish and Portuguese congregation Shearith Israel, with which he remained until his death in 1753. Aaron Machado, presumably a brother, became a freeman in New York in 1739. 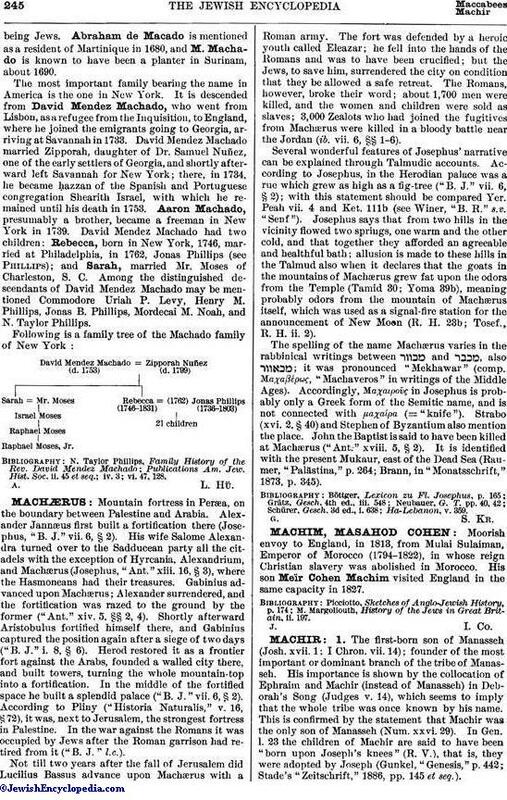 David Mendez Machado had two children: Rebecca, born in New York, 1746, married at Philadelphia, in 1762, Jonas Phillips (see Phillips); and Sarah, married Mr. Moses of Charleston, S. C. Among the distinguished descendants of David Mendez Machado may be mentioned Commodore Uriah P. Levy, Henry M. Phillips, Jonas B. Phillips, Mordecai M. Noah, and N. Taylor Phillips. Publications Am. Jew. Hist. Soc. ii. 45 et seq. ; iv. 3; vi. 47, 128.